Firewalls and network access controls can only go so far in today’s perimeterless, digitally-connected business environment. It’s no longer a matter of if your organization will be breached—but when. Mitigating risk is all about controlling access and limiting the damage an intruder does once inside your network with identity and access management (IAM) solutions that put tighter access and authentication controls in place. Your organization operates in a connected, perimeterless environment, where business-critical applications, systems, and data often reside beyond your control in the cloud. Access control and authentication are more critical than ever. A growing number of contractors, partners, vendors, and contingent workers require access to your systems and data, but you are handling these requests manually and lack visibility into who has access to what and for how long—making your organization vulnerable to insider threats. More and more, third-party vendors require a direct connection to your systems with increasing levels of data integration. It’s critical that you have the proper controls in place to authenticate the identities of these third-party users and provide them with secure VPN access. Your employees are no longer restricted to working within your office walls on desktop computers. Employees today have the ability to work remotely from a variety of devices, putting hardware, systems, and sensitive data outside the control of your IT staff and perimeter security. RapidIdentity is the most powerful and complete IAM solution, meeting all of your identity and access management and authentication needs in a single platform. RapidIdentity locks down access controls and establishes least-privilege access, while adding additional layers of protection with adaptive authentication. So, you can be confident that both your internal and external users have the right access, at the right time, and only for the necessary duration. See why there’s a better way with RapidIdentity. Eliminate the risk of human error and orphan accounts by automating user account deprovisioning and lifecycle management for all users, including contractors, partners, vendors, and customers. Approve or deny access rights and tailor authentication methods used based on risk level. RapidIdentity MFA delivers an extra layer of protection to Active Directory, offline desktop, on-premise application, cloud application, employee and customer portal, and remote, VPN access. Reduce the risk of a security breach with comprehensive privileged access management controls that lock down your administrator accounts and decrease users with multiple accounts. Enforce security without being dependent on periodic or manual recertification campaigns and grant access only for as long as it’s needed. RapidIdentity uses time-based controls and approaches certification as a continuous activity, so your entitlements are always up-to-date. Is IAM at the Core of Your Security Program? 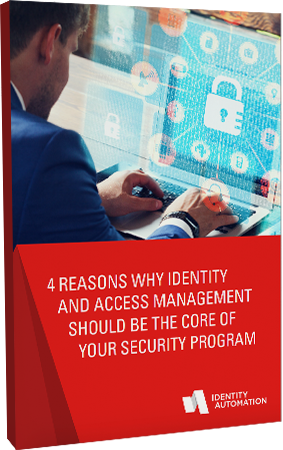 Download our ebook, 4 Reasons Why Identity and Access Management Should be the Core of Your Security Program to learn why it should be. Ready to See How RapidIdentity Can Help?